This review is brought to you in part by Zenzero. When a company has been in a family for a few generations, it’s impressive. Some of those companies have a lineage that dates back well over a hundred years, with a handful stretching back even further, even to the 17th or 18th centuries. Imagine then, the delight of enjoying wines from a family winery that has stood the test of time to the tune of 26 generations! Astonishingly, the Antinori family has indeed been involved in the production of wine for over six long centuries, having entered the Winemakers’ Guild of Florence, Italy in 1385 under founding winemaker Giovanni di Piero Antinori. Today the company is run by Albiera Antinori, with the support of her two sisters, Allegra and Alessia, and the long heritage of Antinori family winemaking continues. 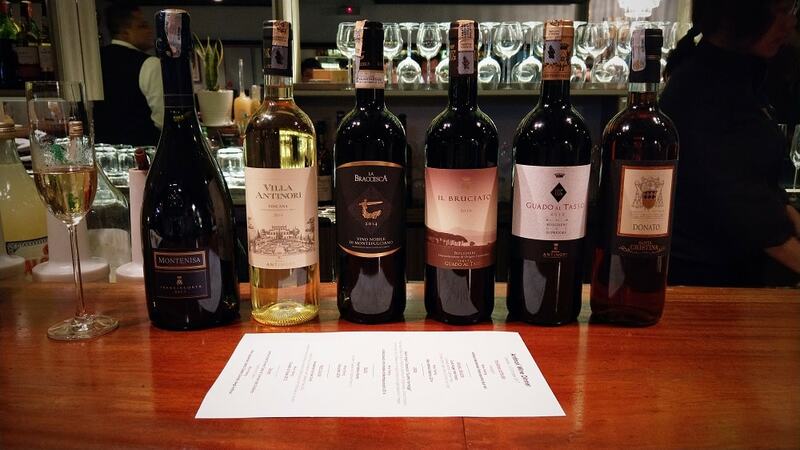 In consideration of this, it certainly seemed a special treat to sample a few of their wines along with the cuisine of Zenzero, a well-regarded Italian restaurant and wine bar located in St. Mary’s Place in Kuala Lumpur, not far from Pavilion KL. The meal kicked off with a pre-dinner sampler platter of canapés served alongside a tantalising Antitori Montenisa Franciacorta Brut NV. The sparkling wine was a perfect aperitif and the only wine of the evening not to be from Italy’s famed Tuscany region. 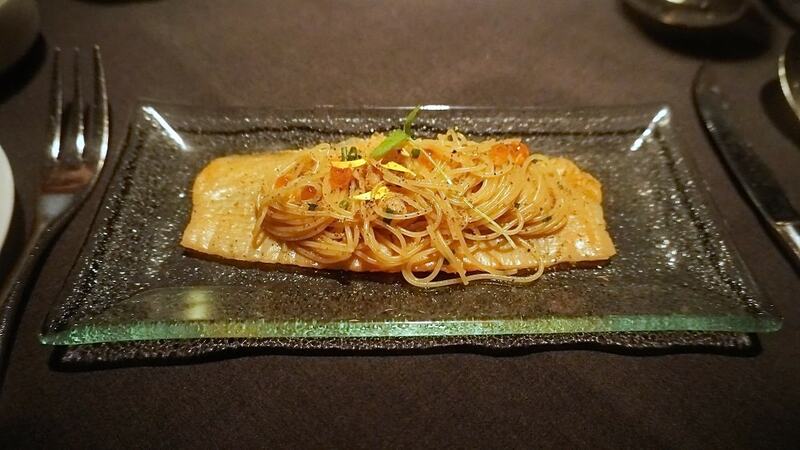 As we took our seats, we were served an impressively portioned amuse bouche comprising cold Angel Hair Pasta atop a thin-sliced plank of smoked salmon, punctuated by salmon roe and topped with extra virgin olive oil, fresh chives, and yuzu zest. This delicious little dish was accompanied by a 2014 Villa Antinori Bianco, a blended Italian white combining Trebbiano, Malvasia, Pinot Blanc, Pinot Grigio, and Riesling grape varieties. The 2014 vintage in Tuscany was an especially difficult one, and this was reflected in the bottle. Though the wine was certainly drinkable and enjoyable, we were told the 2015 vintage was superior, particularly since the wine is meant to be consumed while still quite young. That said, it’s always a testament to a winemaker’s skill to be able to turn a poor wine-growing season into a decent wine, and that’s what was accomplished here. The next wine, however, required absolutely no such caveats. 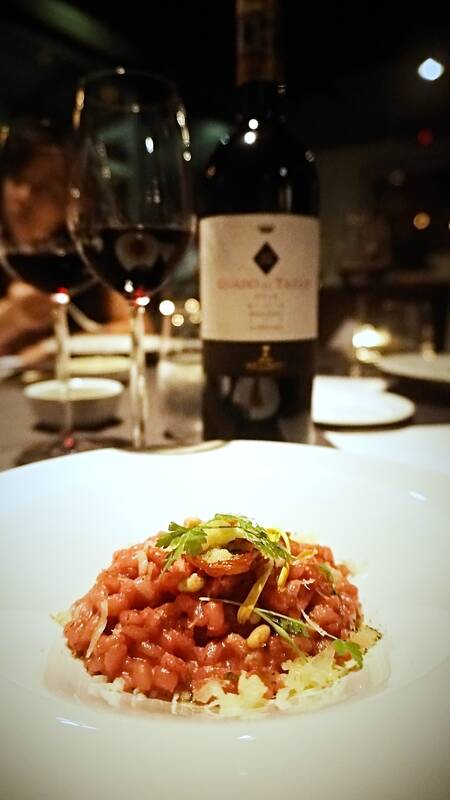 A 2014 La Braccesca Vino Nobile di Montepulciano was poured alongside a serving of an attractively plated Black Angus Carpaccio. A beautiful, plush blend of Sangiovese and Merlot, this wine embodied the elegant body and character of both these grapes, highlighting soft tannins and a full roundness on the palate. The dish featured wafer-thin slices of Black Angus beef with Gorgonzola, Fontina, Grana Padano, and Goat cheeses – a lovely match with the Italian red. The next dish was a Pearl Barley Risotto, which met with mixed reviews around the table though we quite liked it ourselves, despite the mouthfeel taking some adjustment – much more like barley than like risotto! The wine, however, was universally praised, and the 2014 Il Bruciato matched nicely with the nutty, creamy barley dish. The dry red wine is a blend of 55% Cabernet Sauvignon, 30% Merlot, and 15% Syrah, with a nose of ripe fruit, spices, and a touch of leather and coffee. On the palate, the wine is well-balanced with a fruity finish and a pleasantly lingering aftertaste. The main course of Tenderloin and Foie Gras was our favourite of the night, the Black Angus tenderloin perfectly cooked and enhanced by a nicely pan-seared foie gras. The dish was rounded off with potatoes au gratin and a delicious Marsala wine and black umbria truffle sauce, all beautifully complemented with the evening’s final red, a 2012 Guado al Tasso. This Bordeaux-style blend comprises 55% Cabernet Sauvignon, 25% Merlot, 18% Cabernet Franc, and 2% Petit Verdot. Fabulous on the nose, we picked up hints of coffee and chocolate layered in with dark stone fruit and sweet spiciness. Robust tannins proved a perfect foil to the tender beef, and the wine delivered a silky, elegant finish of enjoyable length. A fine wine to complement such a lovely steak. Dessert was a muted affair, a basic but tasty Lemon and Thyme Cake with a dollop of vanilla ice cream and a small Cannoli alla Siciliana, paired with a Santa Cristina Donato dessert wine made primarily from Trebbiano grapes. It would be a difficult task to choose a favourite wine of the night, but we can easily recommend any of the three reds mentioned here. For an all-around Italian red you could confidently serve on its own or with a range of dishes, we’d probably go for the Montepulciano. 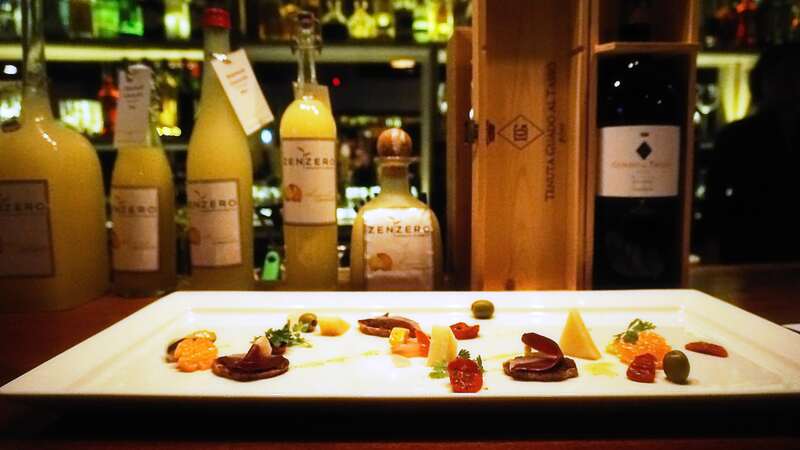 Great food, great wine, and an enjoyable evening spent at Zenzero Restaurant + Wine Bar. If you haven’t tried this charming eatery, we suggest you make a reservation, and if you see the wines from the 26 generation-strong Antinori winery in Tuscany on the menu, you can confidently order a bottle knowing that the passion and skill of over six centuries’ experience provides a solid foundation. Thanks to Zenzero and Antinori for having us. Photos courtesy of Sim Ewe Jin. Find: View directory for Zenzero here.